A strange aircraft (or a Russian one depending on which version you are watching) is shot down by American fighters somewhere near the North Pole. The aircraft smashes into the ice detonating an atomic bomb it was carrying and releasing a giant turtle monster from the icy depths. The monster destroys a jet and stumbles off into the ocean. Meanwhile, flying saucers are spotted on a path across the globe, finally ending up in Tokyo. Those saucers sightings are in fact the monster, who can emit jets of fire from his shell and fly by spinning. The monster, Gamera, by consuming fossil fuels and he’s come to eat his fill in Tokyo, forcing the authorities to concoct ridiculous plans in an attempt to get rid of him. 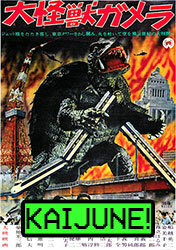 Without a doubt, Gamera was created by the Daiei studio to cash-in on the already well established kaiju films of Toho. Daiei’s creation is much less interested in being a comment on the horrors of war, and instead offers a half-hearted attempt at addressing relevant issues by having Gamera consume fuel. It doesn’t really go anywhere with it, it’s merely used to give the monster some kind of motivation for the humans to deal with him. "Adding more fiber to his diet is really helping!" In his initial outing Gamera doesn’t have a lot of the personality he would develop in later films. In some respects he’s a bit of a generic kaiju, stomping around crushing buildings and breathing fire. Certainly fun but nothing groundbreaking. The little quirks that would eventually give Gamera its weirdo reputation begin to show here and there, Gamera transforming into a spinning fiery flying saucer, his strange interactions with children, and at least in the earlier films, the increasingly elaborate and silly plans that humans put together to try and dispose of the various monsters plaguing Japan, Gamera's first outing features the combined combined military and scientific strength of Tokyo trying to trick him into climbing into a rocket that will be shot to Mars. As was pretty typical for the time, the American cut of Gamera is heavily altered with several scenes (mostly of American extras stumbling through their dialog) replaced with long talky scenes of Brian Donlevy (The Quatermass Xperiment) fighting off embarrassment as he delivers his lines. Dr. Hidaka (Eiji Funakoshi) is the main protagonist and he brings a gravitas and reality to the role that is very compelling. It’s rare in a kaiju film that I’m all that interested in what the humans are up to, but Hidaka’s plight held my attention. Gamera's face after telling a really terrible joke. Gamera isn’t a stellar start for the series, it’s a little slow and most of what it was trying to do had already been done much better in Godzilla (1954). Still, it has an underdog charm to it and there is something goofily enjoyable about Gamera himself despite the very serious tone of the film. As we will see in future sequels, the Gamera films try to strike a balance between camp and seriousness before giving up and tumbling off into the absurd.